This article is starting to look like a saga. You should read this section first and work through the article and updates to the original article. Things have now really changed since December 2016 – out last update. If you go to the Facebook Group called Global Epson F2000 DTG Users Group you will see the good, the bad, and the ugly. If you are looking to buy an F2000 this is the place to start. You simply “join” the group to participate and it is an open group moderated by an F2000 user. What you will see right off the bat is there are still lovers and haters. What might surprise you is you will see people selling their used F2000 printers for as low as a few thousand dollars! And, in all cases the comments are “needs a new head.” That means that they gave up and don’t want to pony up the $3,000 or more to have Epson replace the head and/or they don’t want to pay yearly for a service contract. Epson has still kept the head replacement close to their chest and as of this writing we still don’t know of anyone who has figured it out without Epson’s help. If you read the December 2016 Update below – you will see that back in December 2016 we bought an original OEM head for our F2000 from China for $1,300 – but we could never get it installed without the “secret” Epson software. That means our F2000 is now sitting in the back of the shop as a “boat anchor” because Epson has decided to play hardball with us. They GAVE us the printer – no strings attached – and we trained well over 300 people how to use it and demonstrated it in our monthly workshops – for three years. In fact for the first couple of years of having it we know we helped Epson sell well over 50 printers to our students, customer and referrals. I was very high on the printer. The original article/review below where I talked nice about the printer has had well over 10,000 views since 2013. When the head died Epson would not cut us a deal and wanted us to pay for the replacement head, service call, AND buy a service contract. OK, no love there. It would have cost us well over $4,000 to get the printer up and running – so we could show it to students and tell people how much we loved it. Duh! 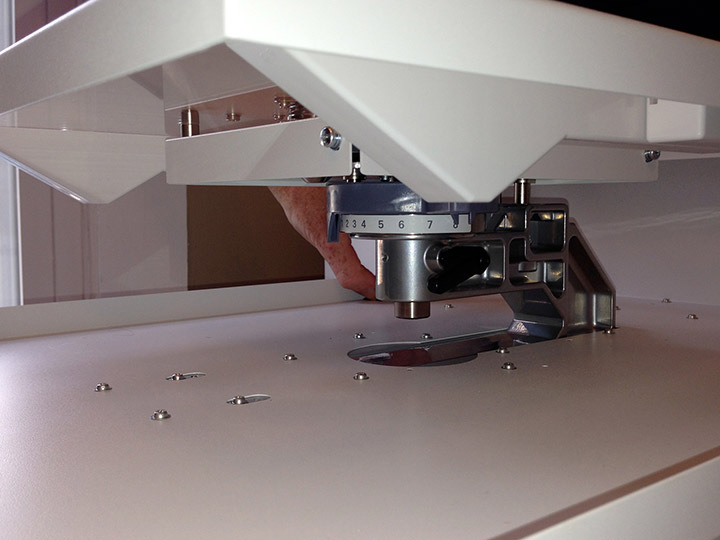 We bought a used T-Jet Blazer for $1,000 and now use that as the DTG printer we show. We can maintain it, use third party ink and print light and dark shirts. That was a GREAT printer and we feel it has a good home – since we are the guys who made it ten years ago! 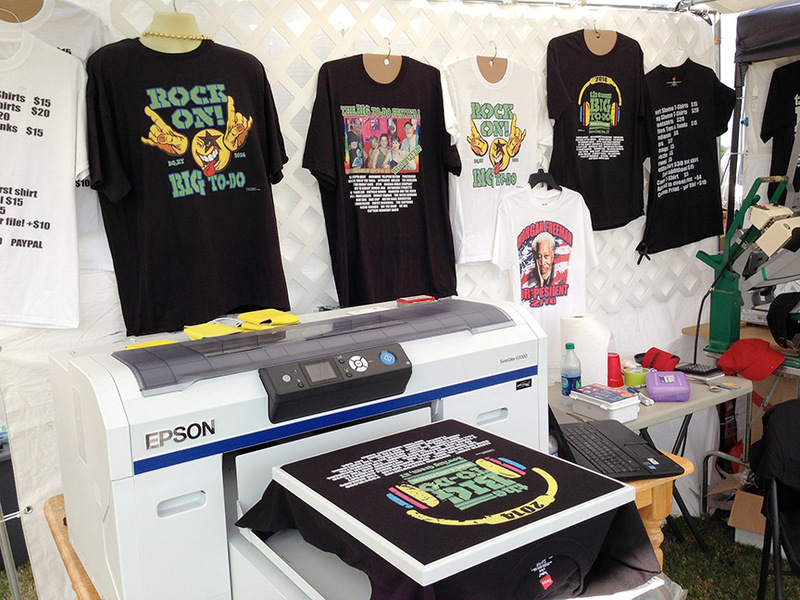 We are also playing with a demo version of the Direct Color DTG printer that uses UV ink. I will report more on that after we do more testing. 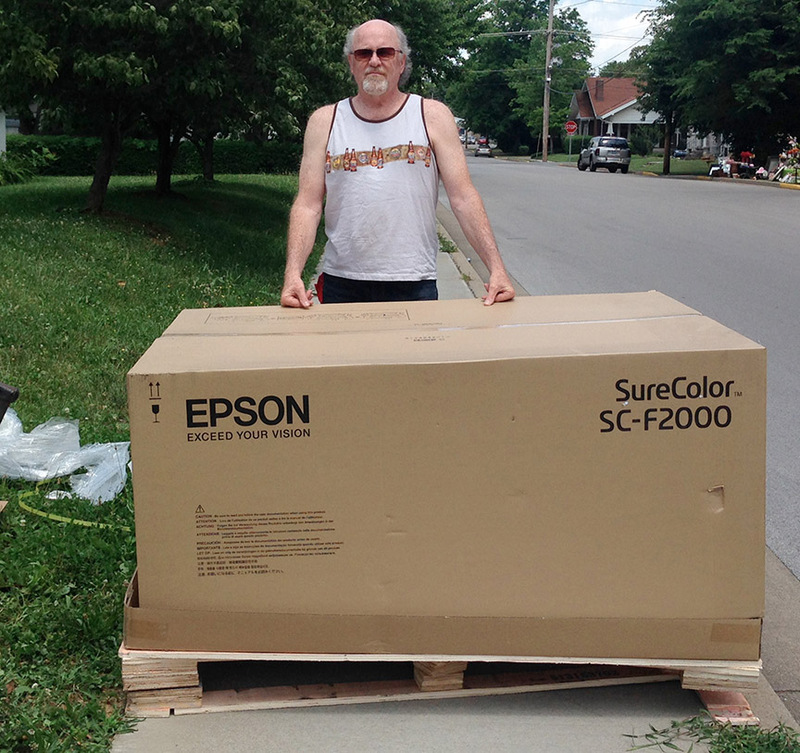 That said….. there are a lot of Epson F2000 owners who love their printer and who have paid for new heads every year or so – as a cost of owning one of these. Again, every brand of DTG has lovers and haters. Read the next section and the original review to get the entire history. 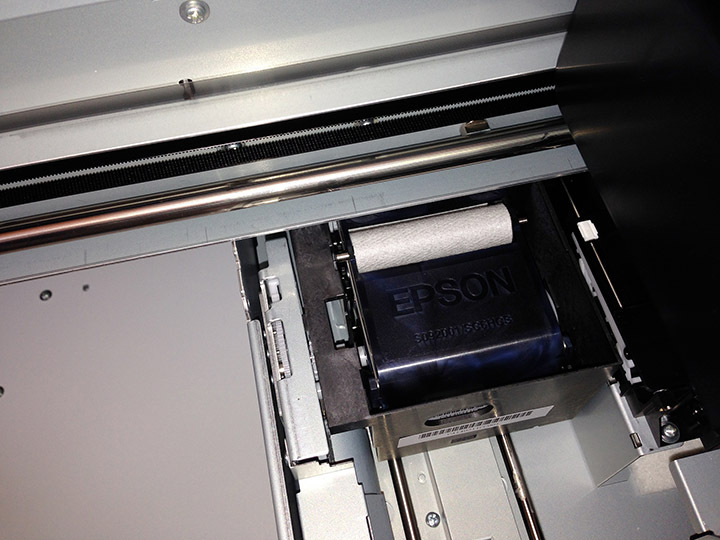 If you are looking for an Epson F2000 printer that needs a new head – contact us. The article below was written back in November of 2013. A lot has happened since then. 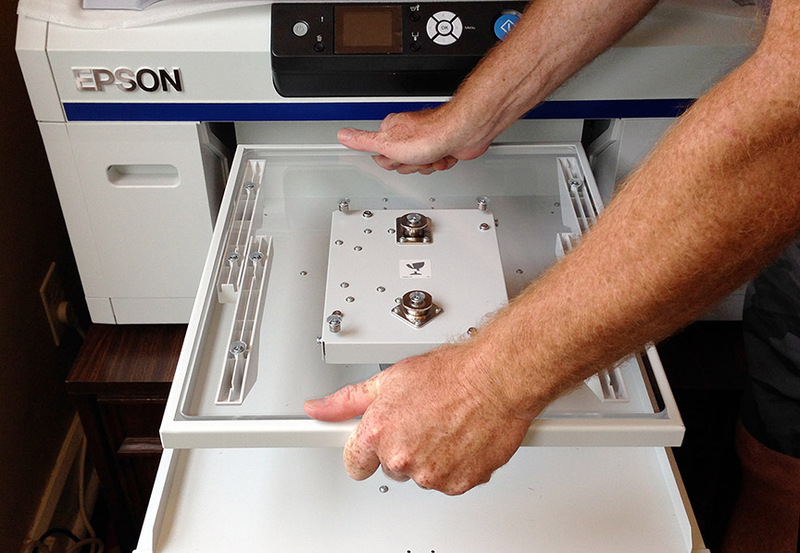 We have now had an F2000 for three years and while we love the print quality and ease of maintenance – a lot of things have started to shake out over the years. There have been widespread reports of people going through a number of heads per year due to clogs and failure. OK, this is NOT uncommon in any DTG printer and users pretty much learn to deal with it. And, it is not big deal if you have a warranty – the head is covered and within a couple of days the Epson tech shows up and you have a new head. Easy! We are currently exploring head replacements using original OEM heads. We have a source and will report back here our findings. 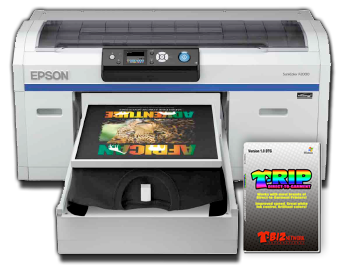 And, there are now a number of DTG ink companies offering ink for the F2000 at a much lower price than Epson. We are also exploring this to see if there are any problems. Check back for updates to this article. The problem is that Epson offers a one year warranty with the machine and then wants you to buy a service contract after that. They do not allow you to replace your own head or service the machine (other than normal maintenance). 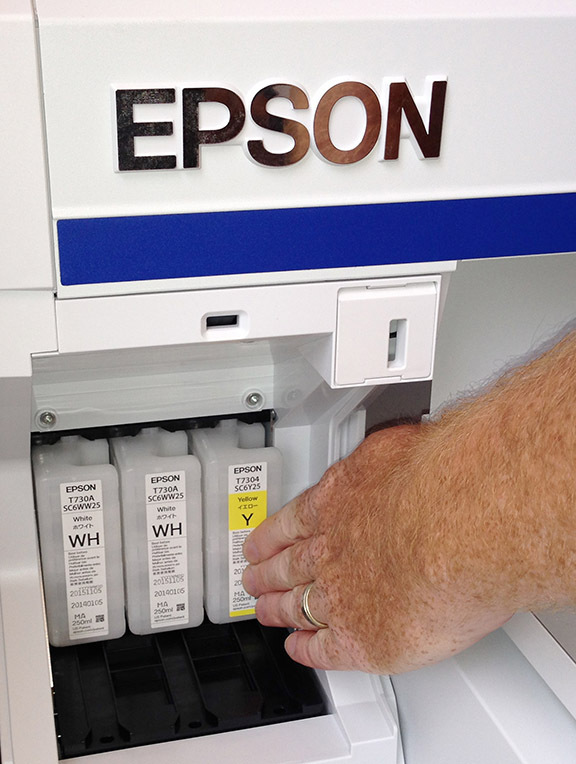 And, we have found in some cases dealers have told customers “you won’t need a service contract because these machines are great.” If you don’t extend the warranty with a service contract – Epson won’t let you do it later down the road. That means you have no way to replace a head other than to pay Epson for a one-time visit – and we are hearing quotes of $3,000 for the head and the tech. We have heard from a lot of users who did not opt in for a service contract who now either don’t print white ink (it is the white ink that always is the issue), or their machines sit ide. This article addresses my opinion on this printer. But, it is not designed to sway you to buy into DTG. If you have been following this topic at all you know that some people love it and some hate it. You have to know the place for it. My feeling – and that of a lot of people who have bought into it – is that DTG is like Embroidery, Vinyl, Sublimation, and other decoration methods. You need them all to compete and this is just one more “department” that is now accepted and necessary in this industry – for the small runs, rush orders and web business. One thing is for sure. There appears to now be “validation” for the DTG process now that a major player is making a machine. I wrote a revised website article a month ago about the printer and my observations and the same day one of my long time screen print customers called told me “I think it is time.” That blew me away. For years my screen print friends had been asking “when will it be the time?” In fact, I know of one local printer who was on the fence for a long time and he now has two of these machines because he does a lot of online business and it fits perfectly. Are they selling as many units as they thought? I don’t have any numbers but over the summer of 2014 Epson was VERY aggressive with $2,000 USD rebates coupled with $1,000 rebates on leases and $1,500 worth of FREE ink. The suggested list price in the US is $19,995 but there are still deals out there and prices seem to be around $17,000USD. That might mean sales could be more sluggish than they thought. As of this writing, February 1, 2015, some dealers are offering huge incentives and I have seen prices now as low as $14,995. Fast forward to February 2015. Has it been a game changer and did they get it right? As for it being a game changer I am not sure. Their initial dealer network in the US was mainly companies who built their own printer. It seemed odd they would be setup as Epson dealers – but that was their approach. Has it hurt sales of competing machines? I don’t really know other than some of the key US players are still making their own machines AND rolling out bigger and better machines. Is there a little “bait and switch” using the Epson brand. I think so. In my opinion this is a well-built printer that has been thoroughly tested and well thought out. It is easy to operate and use. They have been very open about the ink costs and the “rules” on how to keep this printer happy. One items that seems to not set well with users is Epson recommends (demands for the warranty) that you do a full ink “tube wash” almost every month (the printers tells you when to do this), and this can use up to $150USD worth of ink. OK, I can hear the groans. 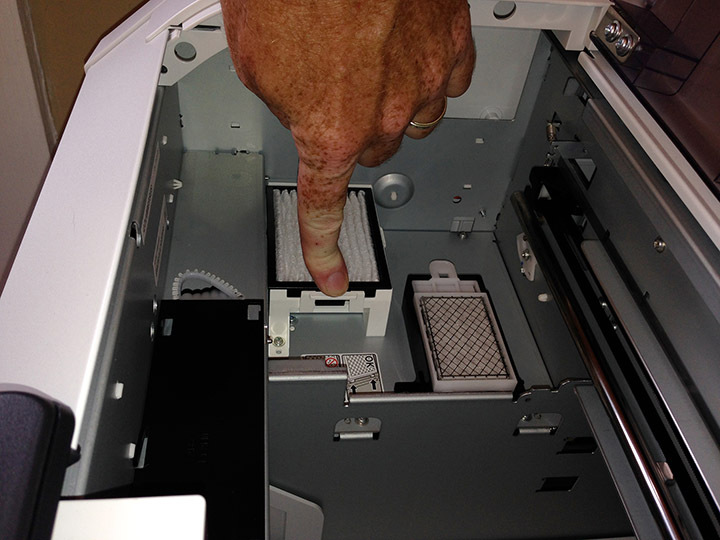 But, this is how they can warranty the head, provide on-site service and keep the printer running like a champ. It is simply the rules of the game. If there is a flaw in their thinking it could be that the printer does not do a white/color print in one pass – a number of manufacturers now offer machines that print the white ink and immediately follow it with the colors – for a great speed increase. 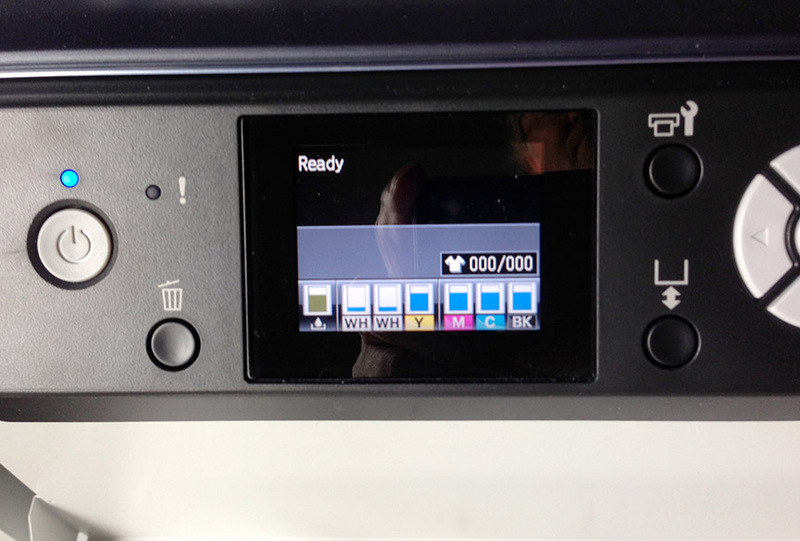 The Epson printer prints the white in one pass and then rewinds and prints the colors. I think ALL manufactures hedge on their print time claims. I was guilty of that. In the beginning Epson was bragging printing a black shirt in a couple of minutes. They have since softened that claim because to print a black shirt in a couple of minutes means using less ink saturation and smaller prints. In my experience with this printer it still takes about two minutes for a full size white shirt print using the maximum ink saturation and it can take over four minutes for a black shirt – again with heavy white (plastisol like) ink deposit and vibrant colors. You can print it faster but the prints will be weaker. Their Garment Creator software is also very intuitive. Having developed software for my T-Jet I was always aware that many users are not good with computers. Their software lets you select a light or dark shirt and you can choose the quality you want (a lot of ink or a little ink). There is even an ink cost calculator in it so you can get a log of what it costs to print each shirt. There is now third party software for this printer from companies like CadLINK and they claim to make the printer print faster and better. I am a dealer for the Digital Apparel Factory and you can read more about it at my T-RIP page HERE. I got involved with a local charity last summer and I decided to see how the printer worked at an on-site event. At 200 pounds – and bulky – we strapped the printer to a dolly, turned it on its side, loaded it into a U-Haul truck, unloaded it, printed for two days at the event, loaded it back up, etc., etc., and it worked GREAT. In fact, when we take the printer to our Printers Boot Camp, we have to move it that way also. It seems to not care if you bounce it around AND you can leave the ink cartridges in it to move it! Epson claims this is their own ink and I don’t know whether that is why it has less clogs or not. But, the prints are very bright and the washability is excellent. This machine is BIG. That is somewhat of a downside. And, they claim you should not tip it more than about 20% to move it. WRONG. At that angle it won’t fit through a standard door. I think they are saying 20% to be safe. Their shirt holder is not too friendly for non-T-Shirt items but I found you can simply remove it and use foam core to make special holders for items like thongs, koozies and more. They offer three different size shirt holders and they have a simple height adjustment and height sensor so it is almost impossible to have a head strike. If your garment is too high the printer tells you and you can simply lower the shirt holder one notch and try again. No drama! and other maintenance items. Of all the printers I have used in the past, this is the easiest and most intuitive to use. I have let the Epson printer sit for as long as two weeks without being turned on. OK, they claim a week would be about maximum. I can turn it on after that long a time and by simply pulling out the ink cartridges (very convenient to use) and giving them a shake and then doing a quick head cleaning I can get a PERFECT nozzle check. Yes, you read it right. Keep in mind I am NOT a typical user and I don’t work for Epson and I don’t sell these printers. In fact I like a lot of the machines on the market and some are faster than the Epson. I don’t print every day and that was and is a problem with almost all DTG printers. Most DTG printers can’t sit for more than a few days without getting serious head clogs because the white ink will settle and clog the ink lines. Once this white ink dried in a line or head it is almost impossible to clear it out. Fast forward to April of 2014. Epson provided me a printer to use in my Printers Boot Camp classes and for evaluation. I have had one of these printers now for ten months and have a very strong opinion on this printer. In three words. I LIKE IT – and here is why. Epson seemed to have addressed almost all of the complaints with other “repurposed” printers and even those that were close to being purpose built. White ink clogs? They recirculate the ink (not a new concept). Head clogs? They warranty the head for one year (in the US – this warranty may be different in different countries). In fact they claim the head is designed specifically for the rigors of the abrasive white ink. Machine service? They offer one-year ON-SITE FREE service (again, in the US and ONLY if you follow their very specific maintenance routines and ink “tube wash” every month). Replacing hard to get to items like the capping station? They designed key parts to be plug-and-play. The key parts pop right out. We are still very high on the F2000. Every brand of machine on the market has some issues and quirks and it seems that the people with issues are now more in the minority. If you like this topic there is a closed Group on Facebook called Global F2000 DTG Users Group. You should request to join the group and you will see long threads about this printer and people who love it – and yes, some who hate it. There is also a general group called DTG Owners Group – All Brands. Check it out. Next articleInksoft Hosts MaxPROFIT Event November 10. It was fantastic!